I have a very exciting product to show to you today and it is this Diamond V-Fit Mask that I receive from a beauty online store called E-Garden. This mask comes in set, in a box. Pretty sleek! In the box it contains a pamphlet explaining on how to use it, the mask sheet, a band called a slimming band that makes me look like I just broke a neck and a measuring tape which I misplace it after taking photo. So I am using my sewing measuring tape in this review. Haha. It just the same thing. 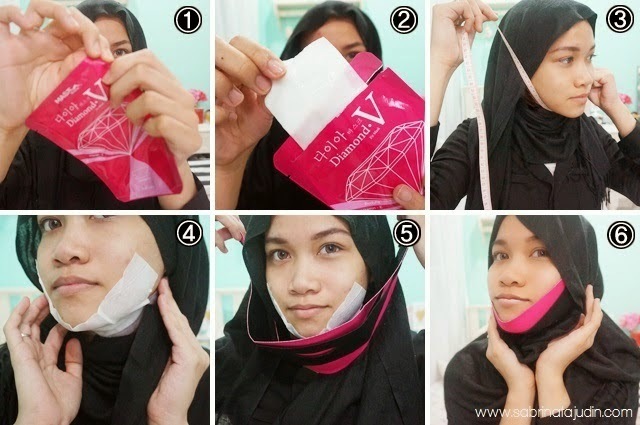 "Diamond V-Fit Mask is the latest Korean V-Shaped facial combination with V-Fit mask and slimming band. With pressure leading technology, Body Fit essence can be absorbed effectively on the cheeks. Lifting up and firming the shape of your face, promotes facial blood circulation and burn up extra fat on the face to remodel a V-Shaped face." So below pictorial shows how I use the mask. I measure my face then I place the mask sheet under my jaw and sequre it with the slimming band. I use the mask for 40 minutes. During that 40 minutes, I felt a very heating sensation under my jaw. It does not hurt but I bet if you use this you cant ignore the heating sensation. So I just play with my laptop wait for it to do its job. After 40 minutes, I remove the band and mask. The mask seems to dried out a bit. The essence really gets into my skin. I swear that this mask works! I am not even kidding you and I don't know how to convince you that below result is real! At first I was like, meh... Could it possible to make my face slimmer in just 40 minutes? It does! From my own assumption, this mask actually helps to reduce face bloating and maybe some upper surface fat around my face. Of course don't expect this mask is going to break your jaw bone to a smaller size. That is crazy. Have you ever heard or experience when you ate to much salty food, junk food and process food. You face tend to look fat or round (tembamb). This is because these food contains sodium and these excess sodium is going to "be around" your face and make you look bloated. You need a very high quantity of water and exercise to reduce this. So if you need a quick treatment and slimming effect, try this mask! As I told you, during that 40 minutes wearing this mask I felt a very warm but bearable kinda heat going on around my face. Like very heating but not burning kinda thing. I think that the heating helps to flow out the sodium out of my face. That is where my face become 2 cm slimmer. Which I think is amazing! My skin also feels firm, tight and hydrated. I went out my room excitedly and ask my mom if my face look slimmer but she said I look the same -_-. I can't really tell how it changes my face shape but I do feel that my face is firmer and slimmer. I can feel it! Conclusion. This would definitely be a mask that I would repurchase for a special occasion other than the SK-II Mask that I love. If I would ever want to get married, I would want to have some mask or pampering time of my own and I already plan to buy the SK-II mask to use a week and a few days before that special day. This mask also has been in my list! I absolutely love this mask and it does help to reduce the bloated of my face instantly. Would be a great treatment before that special day because who want to look round on their wedding day! hehe. But also since this give me such a fast and instant result to my point of view, I don't recommend you to use this too frequently. Maybe a few this in a few month perhaps? I don't know what side effect this could give but what I can say is this would be a great mask to use before a special day or you know when a day that you want to look more slimmer. You know what I mean. Haha. I am not being paid to only say positive things about this mask. I tried this mask on October actually but been so busy and only today i got the chance to blog about it. It is really a a great mask to try! Whoa! Who doesn't want a slimmer face?! Love that this product does really work. only one pcs. a bit expensive but one of the mask that really gives instant effect. :) the band is compulsory, it is the one that helps to hold the mask more firmly.